Cliff Davies was a Welsh prop forward who played for Bridgend, Cardiff, Wales and the British and Irish Lions during the 1940s and 1950s. Davies was a charismatic figure whose early career was interrupted by the outbreak of the Second World War, in which he worked as a miner. He returned and moved from hometown club Bridgend to Cardiff and won 16 international caps for Wales. 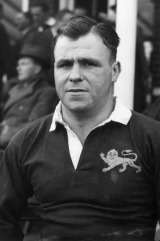 He played in six 'Victory' internationals in 1945-6 before touring New Zealand with the Lions in 1950. A powerful scrummager who could contribute in the loose, he could adapt to the flank if required and also played Sevens. He scored 20 tries for Cardiff in 190 appearances, one memorably coming against the touring 1947-8 Wallabies. He was part of the Welsh team that secured a draw at Twickenham in 1948, creating a crucial try, and two years later he went one better in surprisingly popping up at the end of a flowing move to score in a famous victory - only Wales' second at the venue. It was the one try of his 16-match international career, the launch pad for a resounding campaign that saw Wales score 10 more tries while conceding only a single penalty goal on their way to their first Triple Crown and Grand Slam since 1911. He lost his place in the national side a year later, and retired aged 32 in 1952. He died aged 47 in 1967.